What, you thought we’d let the five-year anniversary of the most liberating, cherished, downright meaningful Boston Red Sox game in modern franchise history pass without raising the proverbial shot glass of Jack Daniel’s in celebration? C’mon now. Like anyone who ever felt real, genuine emotion about the Red Sox could ever forget the date and details of a victory that was generations in the making, a victory you and me, our parents and spouses and children and grandparents wondered if we would ever be blessed enough to witness. October 20, 2004. Game 7 of the American League Championship Series. Final score: Red Sox 10, Yankees 3. Red Sox fans will forever remember it as their day of redemption, the victory that made the deep, personal investment of time and emotion through so many seasons worthwhile at last. Yankees fans? I’m pretty sure they remember it as Thanks For Nothin’ Kevin Bleepin’ Brown Day. I imagine I don’t need to tell you this, but there is not an ounce of exaggeration or hyperbole in the suggestion that the victory set Red Sox fans free. That’s precisely what happened. No more chants of “1918! !” that left Sox fans without a suitable comeback. No more tired network television references to Bucky, Boone and the Babe. And that’s how it should have been. It’s appropriate that beating the Yankees in Game 7 on their turf, having overcome a three-games-to-none deficit in a manner that exceeded a Sox fan’s wildest daydreams, stands as the definitive accomplishment en route to the franchise’s first championship in . . . what was it, 86 years? Now there’s a number we rarely hear these days. And some should, and have, become iconic. David Ortiz, first and foremost. Big Papi, Mr. Clutch, the man who saved his greatest exploits for the tensest moments. His performance in Games 4 and 5 alone should have inspired a film in ESPN’s “30 for 30” series. Maybe two. Keith Foulke, whom we’ll forever believe sacrificed seasons of his career to answer the bell night after night in the grueling ALCS. It’s time to let the Johnny from Burger King pettiness go, folks. Curt Schilling, who managed to shut up 55,000 New Yorkers, send Mystique and Aura scurrying back to their gentleman’s club, and most unlikely of all, added the phrase “bloody sock” to the permanent New England sports lexicon. Derek Lowe, who entered the postseason buried deep in the bullpen and ended it with one of the most improbable playoff feats of all-time, earning the clinching victory in all three series, including his six-inning, one-hit, one-run masterpiece in Game 7 on two days’ rest. Lowe’s performance in that game — particularly considering he began the postseason looking like Nicolas Cage in “Leaving Las Vegas” — remains perhaps the single most amazing moment in a postseason that provided a boxed set’s worth of nominees. How can Yankees fans ever look at him without remembering his role in Game 7? Make no mistake: If there is such a thing as a hero in something as trivial as baseball, then it was Johnny Damon on that particular October night. Foreshadowing bigger things to come, he led off the ballgame against Yankees starter Kevin Brown with a single, then promptly swiped second. When he was thrown out a home on a Manny Ramirez single, Sox fans were hit with that familiar “Here we go again” feeling, but this time, its stay was brief. Papi — you expected someone else? — immediately silenced our yelping about a wasted opportunity, walloping a two-run homer to right. The real fun began in the second. After Brown, who was in desperate need of an anger management course even on his happier days, melted down and loaded the bases, Yankees manager Joe Torre summoned Javier Vazquez from the bullpen to face Damon. You could say it didn’t quite work out as he had hoped. Damon greeted Vazquez with a grand slam on his first pitch, the center fielder’s first of his two home runs on the night. The Red Sox had a 6-0 lead, the rout was on, and redemption for the Red Sox was in the air in, believe or not, the Bronx. The rest was just details en route to the celebration. Oh, there was a little drama, a small shiver of concern, when Pedro Martinez entered to start the bottom of the seventh inning. The ghosts began rattling and the “Who’s your daddy! ?” chants echoed as he took the mound at the scene of the previous year’s crime. 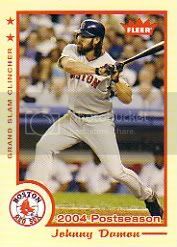 But after three of the first four batters reached, with two runs scoring to cut the lead to 8-3, he retired John Olerud and Miguel Cairo to end the inning. Pedro escaped. And that’s when it hit us: Holy [pick your own word], this is really going to happen. And so it did, and while some might dispute this, the circumstances of the victory made it worth the wait. It’s almost as if it had to be that way, with that wildly talented, carefree, yet determined group of ballplayers being the ideal — perhaps necessary — mix of personalities to overcome all the history. And did we mention the 3-0 deficit? Five years later, what transpired that night means every bit as much to us at it did at 12:01 a.m. on Oct. 21, when Ruben Sierra grounded to Pokey Reese for the final out, and the Red Sox, at long last, did not turn back into a pumpkin after midnight. History, of course, wasn’t the only thing to change. Our perception of the Red Sox did as well, and for the better. Oh, some Sox fans went digging through the boxes in the attic for that old familiar angst after the 2009 edition was eliminated from the postseason in three games last Sunday. But for most of us, with fulfilled dreams came perspective. The realization that the Angels probably deserved to defeat a flawed Red Sox team was enhanced ever so slightly by the realization that they had finally overcome a team that had served them so many helpings of cold disappointment through the years. Five years ago, those colliding feelings of triumph and retribution and, most of all, pure, delirious joy, belonged to us. Five years later, the memory of what Papi, D-Lowe, Damon and the rest of that wonderful crew accomplished that night remains ever so sweet.